Gesundheit! It is the thing we sometimes say just after a person sneezes. German in origin, it literally means, “health”, as in a blessing of good health. It has been in popular use since 1914, and didn’t make any more sense then than it does today. We wish a person good health immediately following a convincing demonstration that they have anything but. Fortunately, most sneezes do not indicate anything dire. Perhaps you inhaled a bit too much paprika while preparing dinner. We won’t talk about food contamination while sneezing in the kitchen. A cough, on the other hand, can have plenty of serious implications. Funny that we don’t have an old Germanic word expression for that. When someone nearby has a real coughing fit, we don’t know what to do or say. That is because they could have anything from a drop of liquid in the windpipe, to a cold, flu, or even tuberculosis. How do you diagnose a cough, not to mention how to sort the difference between a cold and flu? Influenza, otherwise known as the flu, is cause by viruses that infect the respiratory tract. Unlike a common cold, the flu can kill you. On the high end of the estimate, the CDC believes there may have been as many as 1,633 flu-related deaths per year during the 30-year period between 1977 and 2007. Number of deaths from the common cold, zero. There are three types of viruses that account for influenza: type A, B, and C. Influenza A is the biggest troublemaker for humans. Once contracted, it is common to be completely rid of the flu in one or two weeks. However, some portion of flu sufferers develop life-threatening complications like pneumonia. Stuffy nose, soar throat and sneezing are hallmark signs of colds. They are only sometimes present in cases of the flu. 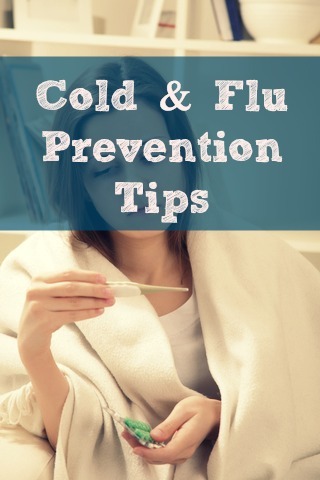 It will come as a surprise to many that a flu can come and go without these symptoms. If your sneeze is worse than your cough, that might indicate a cold. If the cough is more prominent, you may be dealing with the flu. It is also important to note that while you may suffer a little fatigue and weakness with a cold, extreme exhaustion is never associated with a common cold. That is reserved for the flu. If your exhaustion is accompanied by a headache, you are almost certainly dealing with the flu rather than a cold. Aches and pains are another key indicator. 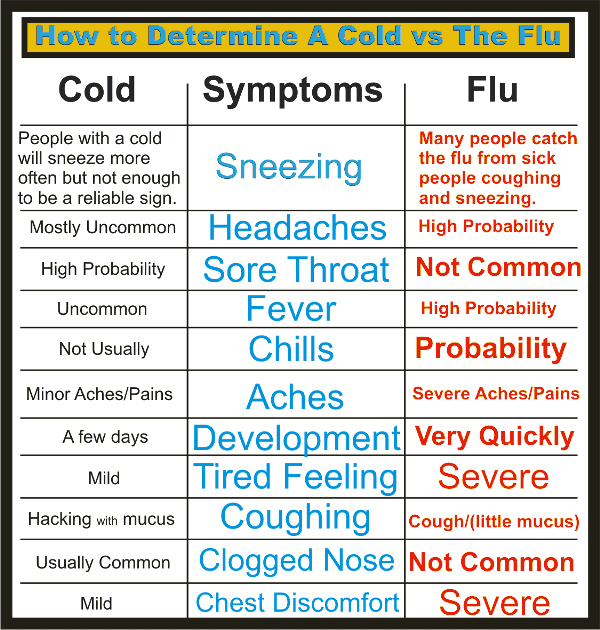 While both conditions may cause some aches and pains, they are much more severe with the flu than a cold. With a cold, you will have some achiness just from the muscular exertion of coughing and sneezing. There is a lot more going on with the flu. It all has to do with the body’s defense against infection. When infection is detected, the body turns up the heat as a defense mechanism. That is why you get a fever. If you didn’t, you might have even bigger problems. But that added heat causes dehydration. Your muscles suffer as a result. It could be that the reason we have no cure for the common cold is that it is not a danger to society in the grand scheme of things. We do not die from colds. How many research dollars should we shift from cancer to fight a cold. Hopefully, zero. Because zero is exactly the number of cures we have for the common cold, we have countless home-grown treatments. Choose your favorite and keep on trucking. Anything that makes you feel better and gets you back to work is probably just fine. You will be just fine in a few days if you do nothing at all. The flu is a completely different animal. If left untreated, it can lead to serious and life-ending complications. There are research dollars pouring in for the flu. The result is that we have reasonably effective inoculations. Doctors and pharmacists do not just cook up flu shots in their private labs. They have to buy them from wholesalers like Nationwide Medical who can provide the drugs at reasonable prices, making them highly accessible to just about everyone in the country, regardless of insurance. Without these wholesalers, the flu would be a much bigger threat to public safety than it is today. CVS also suggests that 1 in 6 people will get the flu. That’s a lot. If you happen to be one of them, there are still treatments. Among them are Symmetrel, Flumadine, Relenza, or Tamiflu within 24-48 hours after onset of symptoms, as listed on the above chart. Flu season usually starts in October, continuing for several months. Some years are worse than others. By the time you read this, flu season 2014 will be fully upon us. The best thing you can do to protect yourself other than a flu shot is to know the signs. 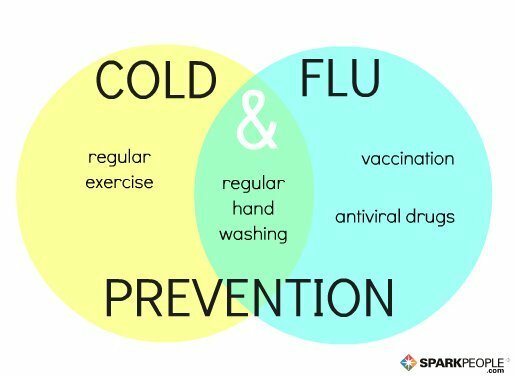 Being able to differentiate a flu from a cold may be the difference between life and death.